My daughter loves American history and she has read all of the Little House on the Prairie books. I haven’t read the books since I was a kid, so my daughter was the resident expert on pioneer times. I like to make our parties fun, but also with lots of learning. I also get much more excited when I get to learn something too! 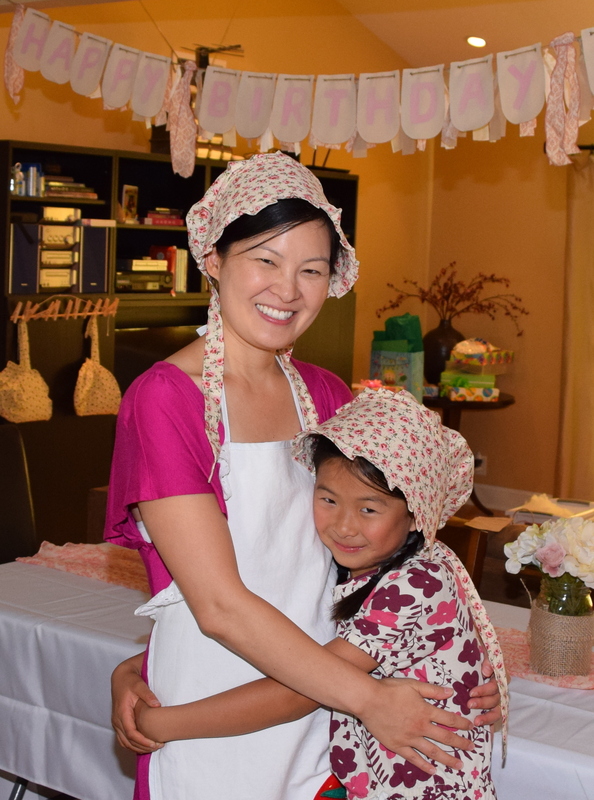 For our Little House on the Prairie party activities, we decided that we would have the kids doing “jobs” where they would earn some money and then after they finished all their jobs they would get to spend their money at the General Store. When the kids arrived, I explained that we would be pretending to be living in pioneer times. I gave them each a general store ledger where they would keep track of the money they earned and spent. I had the girls choose a bonnet to wear and the boys got a farmer’s hat and suspenders. I really wanted to have Little House on the Prairie bonnets at the party, but I was worried about the expense. I considered using this sewing tutorial to sew my own bonnets, but in the end I decided it would take me too long. Instead I bought Americana bonnets on Amazon. There are multiple listings for the Americana bonnets and the prices vary between about $9.99 and $14.99. 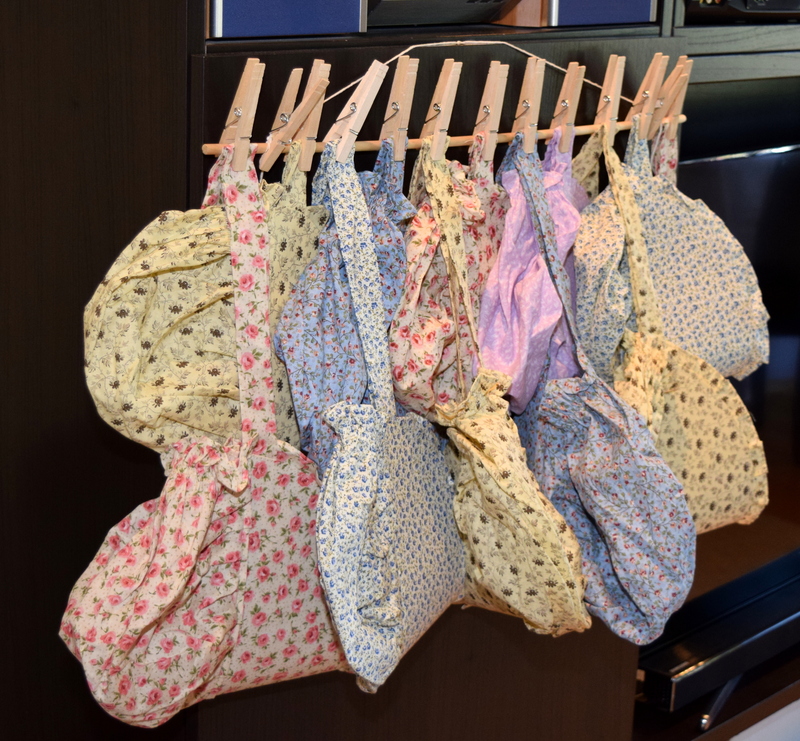 The Americana bonnets come in four sizes. Some of the listings allow you the select the color. Initially, I bought a size Medium bonnet and a size Large in this cream with roses print. I have a small head, but the size Medium was too small for me. The Large was a good fit, although the brim is a little smaller than I would like. The Medium and the Large fit both my nine-year-old and my six-year-old. Then I found bulk pricing for pioneer bonnets on the Music in Motion website! They are the same Americana bonnets and they are $6.50 each if you buy 12 or more. You do need to pay for shipping, but the per item price is still lower than Amazon’s price. The Music in Motion site does not say what size they are, but the 12 pioneer bonnets I received are all size Large and they gave me a good assortment of colors. The bonnets arrive folded with a crease down the center of the brim. Ironing the brims made them much more presentable. The tag says they are 100% cotton, but I still used a cool setting on my iron since I did not want to risk melting anything. For the boys, I was inspired by the cover of Farmer Boy. We had them wear farmers’ hats and suspenders. They looked so cute! Amazon has the hats in a pack of 12. You can also buy them directly from the Shindigz website individually. The hats are a little big, they can fit an adult, but the kids didn’t seem to mind. I purchased 30″ suspenders from Amazon in a few different colors. It says they are good for heights up to 5′ tall, but I think they are probably better for up to 4′ tall. They were good for the six-year-olds at our party. For the eight and nine year olds, the adult size suspenders that I got at Shindigz were a good fit. At the time, Shindigz had them on clearance for $1.49, but they are sold out now. These and these adult suspenders on Amazon look like a good alternative. I usually keep decorations pretty minimal, but I decided to make a banner and floral arrangements. I have a lot of mason jars on hand for cooking and fermenting, and I used quite a few for the party. At Michael’s, I found Craft Smith canvas banners on clearance and I painted Happy Birthday on them with acrylic paint that I already had. I put a rag ribbon banner behind the canvas banner to make it look more festive. I made four little flower arrangements and put them in mason jars. I wrapped the mason jars in some burlap (similar to this) I already had. I laid out our collection of Little House books on one of our tables. The books included The World of Little House, which is a beautifully illustrated guide to Laura Ingalls Wilder’s life and books, and our Rocky Ridge books, which are Little House sequels written by Roger Lea MacBride, Laura’s daughter’s friend and heir. I purchased a pack of kraft paper bags from Michaels with their 50% off coupon and I tied a little thank you card on them with their names written on the back. The bags were empty and they would use them later for their general store shopping. I told kids that didn’t want to wear their bonnets to put them in their bag. We had four main activities: Milking the Cow, Spinning Wool, Churning Butter, and Hunting. 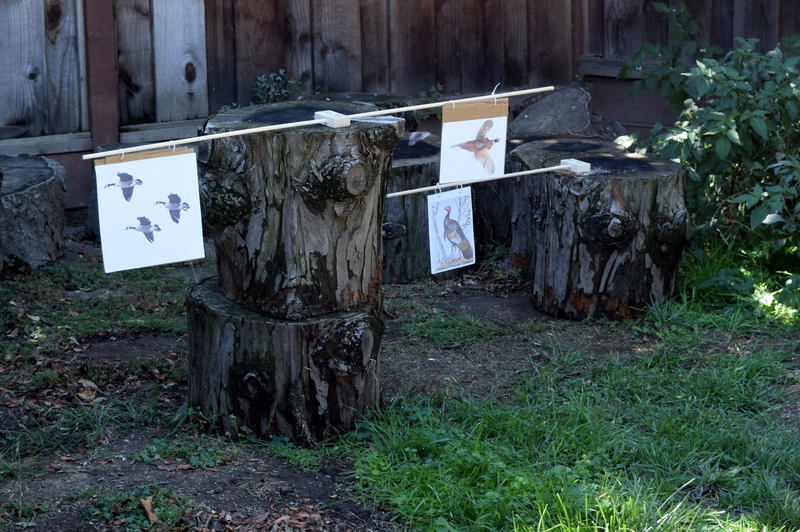 For younger kids, I usually set up stations where they can come and go as they please, but for the 8 and 9-year-olds, I ran it like a pioneer workshop. As kids arrived, they got their bonnets and hats and then they could milk the cow or build with Lincoln Logs. My husband set up the cow milking station with saw horses and a wire shelf that was sitting in our garage. We covered the saw horses with cow print table covers to make it more cow-like. We filled disposable gloves with water, clipped them closed, pierced the glove’s fingers with pin holes and hung them from the cow milking station. We put a bucket underneath each glove and a stool before it. We told the kids to milk their cow and then to pour their “milk” into our milk can. Once they were done milking regardless of the quantity, we had them write “cow’s milk” and “5” cents on their ledger. To get an old-fashioned look for all of our signs and the kids’ ledgers, I printed them on white card stock and tea stained the paper. It just took two black tea bags, a baking dish to soak in, cookie sheets to dry on, and a warm oven set to 200 degrees to speed up the drying process. I followed these directions and I used method #3 where you pour the tea directly on the paper. My husband didn’t think I should go to the trouble of making the paper look old. He insisted that the pioneers’ paper wouldn’t have been old for them, and it would have been new and white. I disregarded him and happily continued tea staining my paper. 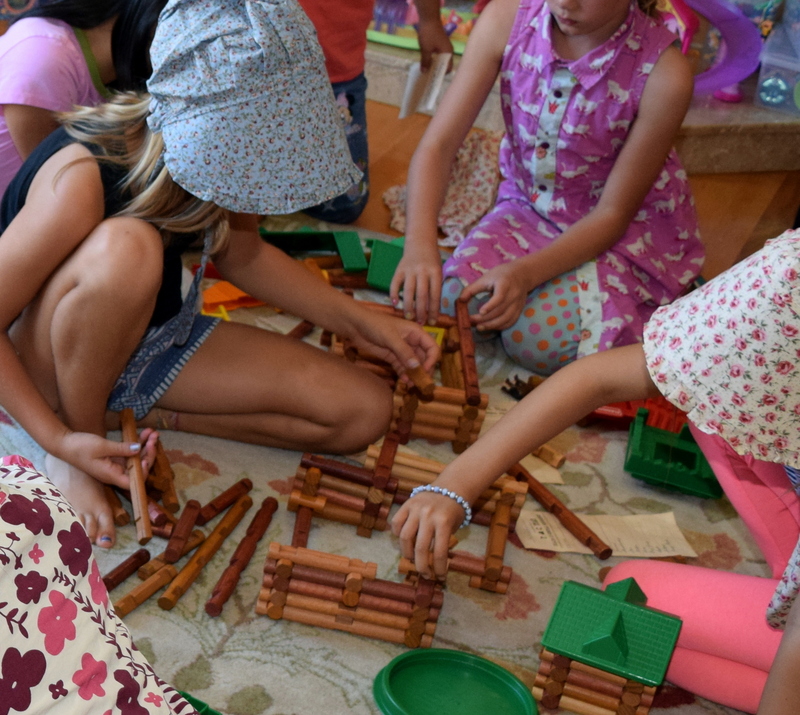 We happen to have a lot of Lincoln Logs, so it was natural to pull them out for our prairie party. I had purchased them used on craigslist a couple of years ago. Brand new Lincoln Logs are pretty pricey, but they last a long time so they are a good thing to try to find used. I was thinking of having a sheep art project where they pull apart cotton balls and glue the cotton onto a printout of a sheep’s outline. Then I stumbled upon a YouTube video of a lady spinning wool with a simple drop spindle. She made it look so easy, and I thought that would be so fun for our pioneer party! Unfortunately, when I tried it, it wasn’t as easy as it looked. I discovered that it is only quick and easy once you know what you are doing. As I said, I like learning new things, and I didn’t know anything about sheep’s wool or spinning yarn, so learning to spin wool was my new mission. I bought a drop spindle like this one and some merino wool roving, and I watched a bunch of videos about the park and draft method of spinning. I figured out how to spin about a foot or two of bumpy two-ply yarn with the drop spindle and decided that was good enough for our party demonstration. The drop spindle would be too complicated for the kids to learn at the party, so I also figured out how to spin yarn by thigh spinning. My daughter said that the wool demonstration was a little long, but she said she enjoyed it. I gathered up all the kids and had them sit facing me. I asked them questions like “Where does wool come from?” and “How do we get yarn?” and told them that people have been spinning wool for over 10,000 years. We talked briefly about spinning wheels. I told them that yarn is just wool fibers twisted together and that people can spin wool with just their hands or a simple tool like a drop spindle. 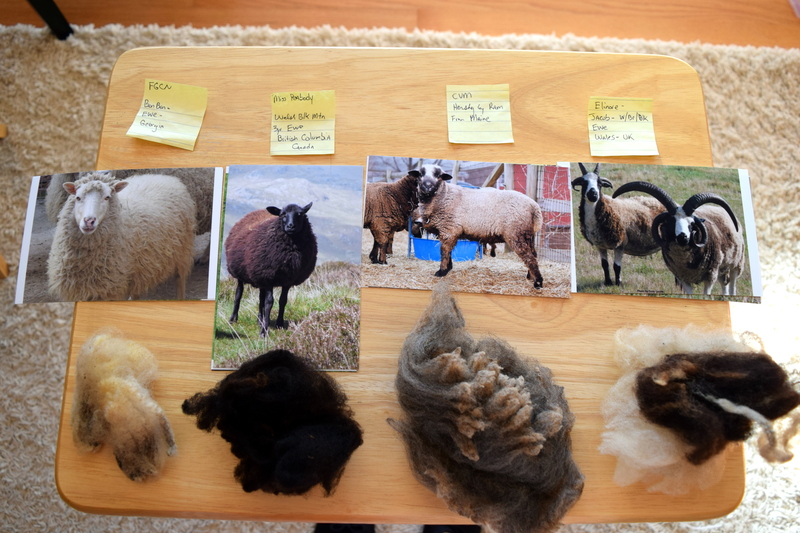 Then I passed around samples of raw wool from four different breeds of sheep along with a corresponding picture. I got the raw wool samples from Ared2Die4 on Etsy and they were inexpensive and fun to show to the kids. I warned the kids that raw wool is dirty and that we would wash our hands after touching the samples. Samples of raw wool from different breeds of sheep: Florida Gulf Coast Native, Welsh Black Mountain, California Variegated Mutant, and Jacob sheep. Next we talked about washing wool and picking wool. I purchased 8 oz of washed wool on eBay. Make sure the wool fibers are long enough for spinning, some wool is just for stuffing. 8 oz of washed wool was way too much, 4 oz or perhaps even less would have been fine. I held out a bundle of the washed wool and let each child grab a handful. I asked them to pull the wool apart and to also extract a single fiber to inspect how long it was. 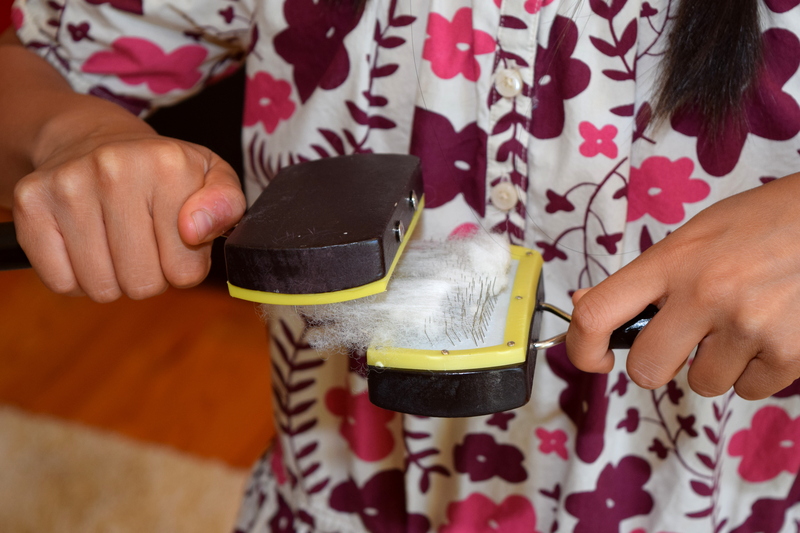 I bought 10 dog brushes at the dollar store to use as inexpensive wool carders. I watched this YouTube video to figure out how to card wool with dog brushes. I briefly showed them how to card the wool to get all the fibers aligned and then I did a quick thigh spin of the carded wool to make a little 2-3 inch long piece of two-ply yarn. Next, I did a mini drop spindle demo with the wool roving. Before the party, I had already separated the roving into little single serving sizes that would be manageable for the kids to try to spin. 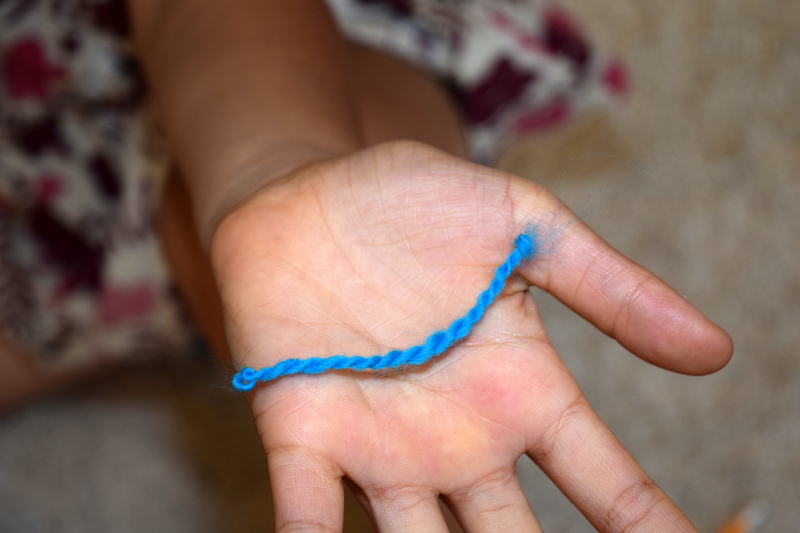 We passed out the roving and I asked the kids to just draft (pull apart) the roving to get a feel for how long the fibers are and where the fibers separate. Then we gave everyone a second piece of roving and we asked them to try thigh spinning. They would only need to draft the wool a little since it was already a thinned out piece that wasn’t very long. Once their little piece was nice and twisted, they matched the two ends together and it would naturally twist together to become two-ply. An adult tied a knot on the two ends and their 3 inch piece of yarn was spun! I was surprised that most of the kids were successful, only a couple needed help. They put their yarn in their bag and then they got to write 10 cents for wool yarn on their ledgers. Once they were finished, they got to try carding the wool with the dog brushes. 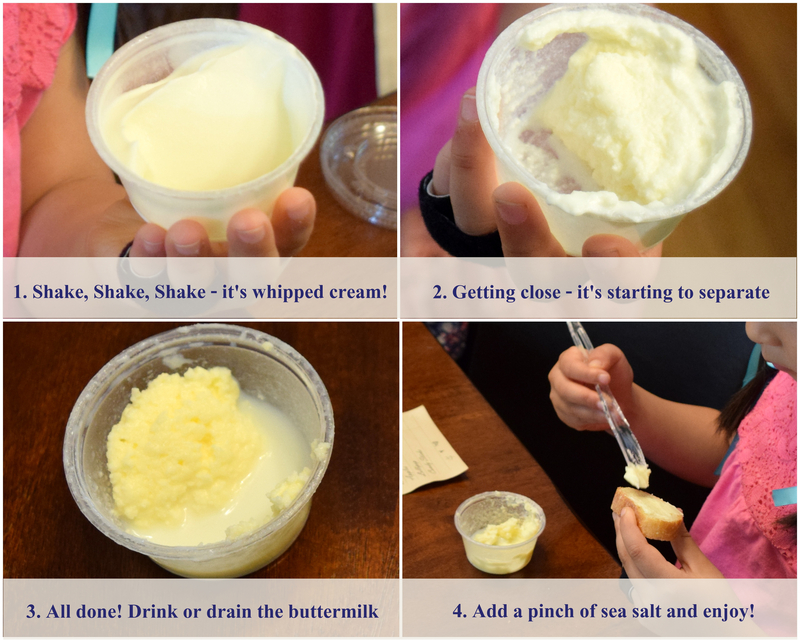 Churning butter is fun and simple for the kids. We poured about an ounce of organic heavy whipping cream into plastic 2 oz condiment cups. This made about a tablespoon of butter which was a good amount for them to spread onto their bread. Do not use glass jars! Little baby food jars with a soft carpet underneath might be okay, but even the 10 year old at my party dropped his cup of butter while he was shaking it. One of the girls attending the party raised her hand to share a story. She told us that one year her class made butter in glass jars and multiple kids shattered their jars when they dropped them in the classroom. What a mess that would be! The condiment cup lids do not stay on very well, so there were a few spills, but much easier to deal with than broken glass. I found condiment cups at Smart & Final. They are also on Amazon, but a little more expensive. I was surprised we had so many spills. In hindsight, I would instruct kids to hold the cups with their thumb on the bottom and their fingers spread out so that they are holding down the edges of the lid. Also ask kids not to open the lids to peek at the contents until the butter is ready. Once they open the lids, the cream gets on the rim and the lid won’t close as well. It may have also helped if I had poured a little less cream into the cups, the cream gets pretty foamy and expands during the shaking process. It takes about 10 minutes of shaking for the butter to form. It can be as quick as 5 minutes if the child is very vigorous and dancing around or 15 minutes if there are pauses or they are shaking slowly. 6-year-olds and up did not have any trouble completing their butter, but a couple of the younger siblings needed an adult to help them. If you are doing this with younger kids, you might want to lead a butter churning parade to keep them going. I put on some of Pa’s fiddle music to keep everyone motivated while they were shaking. Lisa Orstein’s recording of Old Bunch of Keys was a good one to play when the kids started getting tired. After a few minutes of shaking, the cream will become whipped cream. Keep going and then the cream will start looking thicker and with some small lumps. Then suddenly it will feel like there is a soft, but solid mass shaking in your cup. Open your cup and you’ll see a little blob of butter separated from the buttermilk. I told the kids they could drink the buttermilk but strangely many were afraid to. I had a cup they could pour the buttermilk into if they did not want to drink it. I sprinkled on a tiny bit of sea salt for them and asked them to stir it with a plastic knife. They spread their butter on a piece of baguette and enjoyed their freshly made butter! Then they got to write in 9 cents on their ledger for making their butter. We stopped for a brief snack at this time. 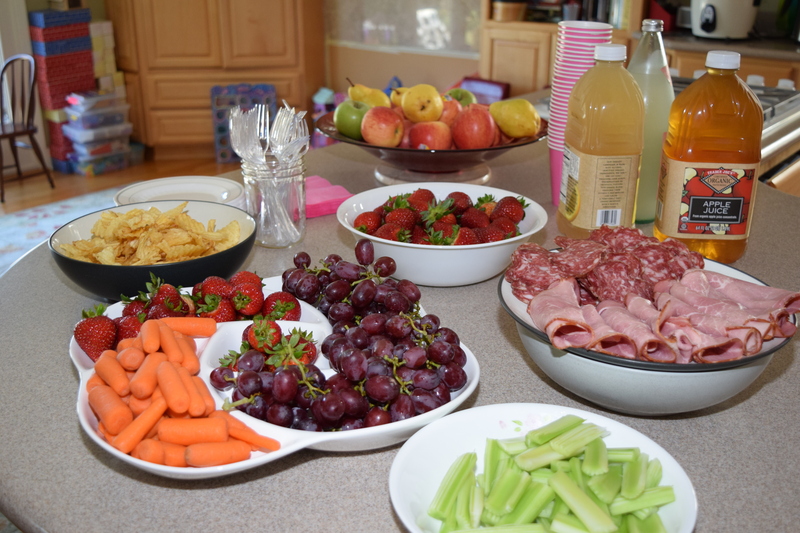 Most kids were thirsty after the bread and butter, and we had snacks out that people could munch on as they wished. For the ham and salami, I was thinking about getting a chilled dish like this, but I realized that a bowl filled with ice and a plate on top would work too! As a precursor to hunting, we told them they had to learn how to track animals. We played an Animal Tracks match up game. I got the cards from this great free printable and I laminated the cards. We wanted to make this a social game, so we gave each kid a card and a few kids got two cards. We asked them to walk around to find their match. Then I was going to have them stand next to their match, hold up their cards, and ask the group if they thought the match was right or not. My husband ended up running the game without my instructions, so it didn’t quite go this way but it was still fun. Now it was time for the hunting. We herded the kids outside into our tiny yard. My husband had set up a little Nerf gun shooting range. He stacked a few of our wooden tree stumps and attached dowel rods to them with some screws and scrap wood. He used zip ties to hang the pictures of the animals from the dowels so that the picture would swing if the kid hit the target. I insisted on only using illustrations of birds since I wanted it to feel like a game and not realistic. I also didn’t want them shooting at mammals, since that seemed more aggressive. For our targets, we had wild geese, pheasant and wild turkey. My husband gave them a little Nerf gun safety talk and had them line up behind the starting line. Each kid had six shots to hit all three targets. My husband placed the targets so that it wasn’t too easy or too hard. Most kids weren’t able to hit all three with just three shots, but all were still able to hit all three targets within six shots. Once they finished with their hunting, they got to write in 6 cents and then they came in to our General Store table. Having the kids come in a few at a time worked well so that I wasn’t mobbed with all 16 kids at once. I asked them to add up how much money they had earned. If they completed everything, they had 30 cents. For the third graders, the adding was no problem, but I had to help some of our younger kids with the adding. On the ledger, I had already printed out the items we had for sale, so they just had to fill in the price. The prices were all listed on the table, along with item limits per customer. I tried to make the prices historically accurate, but it ended up being only vaguely accurate. I gave them their bag, told them to put each item they wanted to buy in their bag, and fill in their ledger with their purchase one by one. This was a nice practical math activity for them, since they had to track how much they had spent and how much money they had left. For the third graders, they were able to manage this all themselves. We had a few younger kids and they had to be led through the process. They couldn’t read the signs or add very well. With younger kids, you could use smaller numbers or give them something like 10 pennies to spend to make the process simpler. I was also selling ribbon and lace by the foot, which I would measure and cut for them. I had my change jar nearby, and I gave kids change if they did not spend all of their 30 cents. Giving them change was good because some of them changed their mind and wanted to buy an additional item later. Then they could fish the coins out of their bag to pay for the additional item. 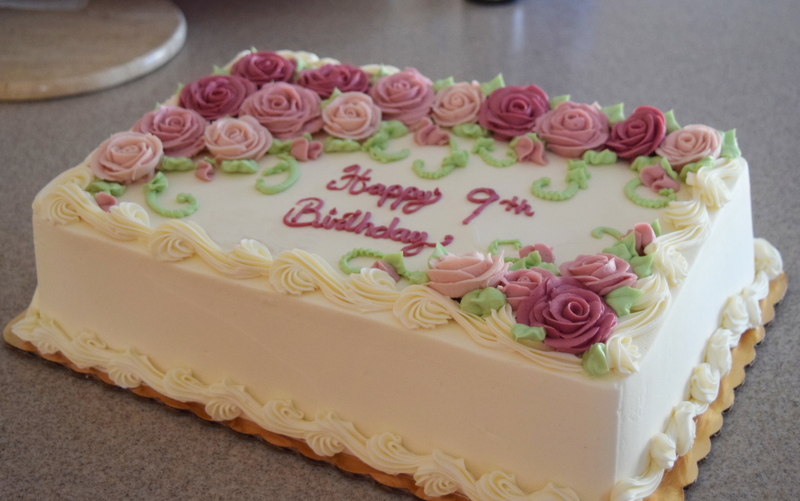 I usually get our cakes from Whole Foods. Low quality oils that many other stores use make my skin break out, so I try to avoid them. Roses in vintage pinks was perfect for our prairie party. The general store shopping was enough for a goody bag, but I wanted to share the Little House books with my daughter’s friends. We bought box sets of the Little House books with full color illustrations. This set only has the first five books, but I figured that the earlier books would be more popular. Also the ninth book, The First Four Years, is kind of a sad book, and I didn’t want to end up with multiple copies of that one. I also had a Laura Ingalls Wilder biography in the mix in case a kid had already read all of the Little House books. I had the books in a basket and asked the kids to choose a book when it was time to go home. 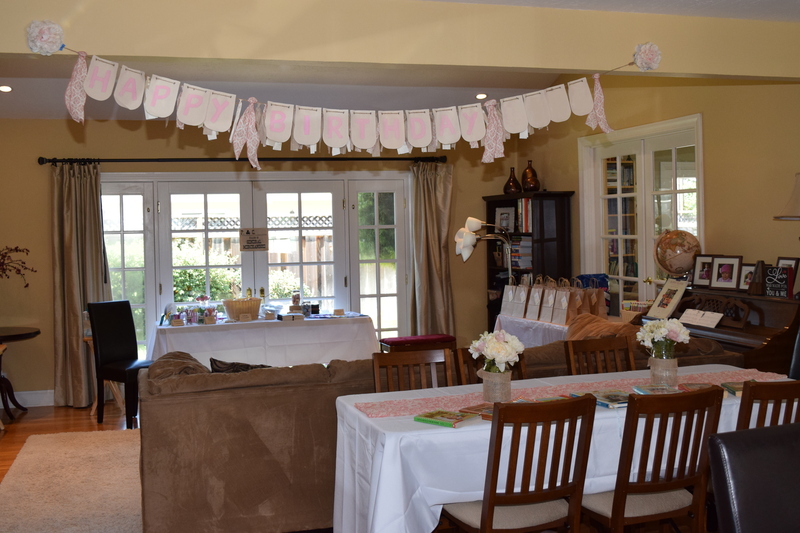 Our Little House on the Prairie Party has been one of our best party themes. Our pioneer day was fun and educational for the kids, and promotes literacy too. I loved the fact that we were showing kids how to be DIYers and makers. 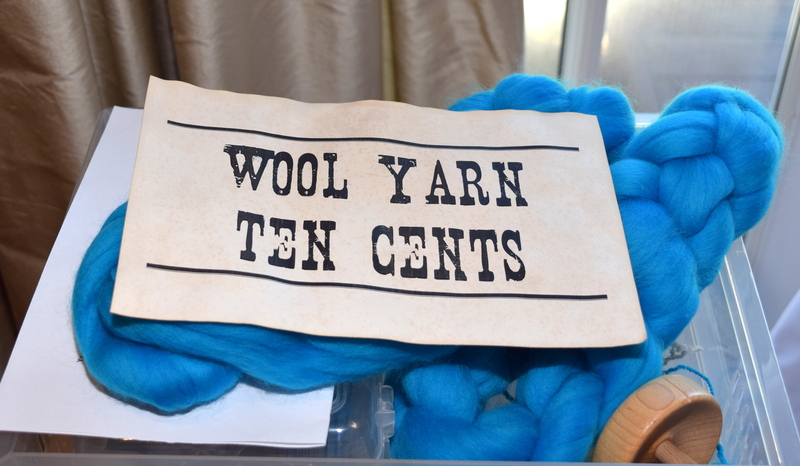 If I were doing a pioneer party with younger kids, I would leave out the drop spindle demo and set up a wool carding station instead. Another great Little House on the Prairie party idea would be to set up a laundry washing station with an old-fashioned washboard – little kids always love playing with water! 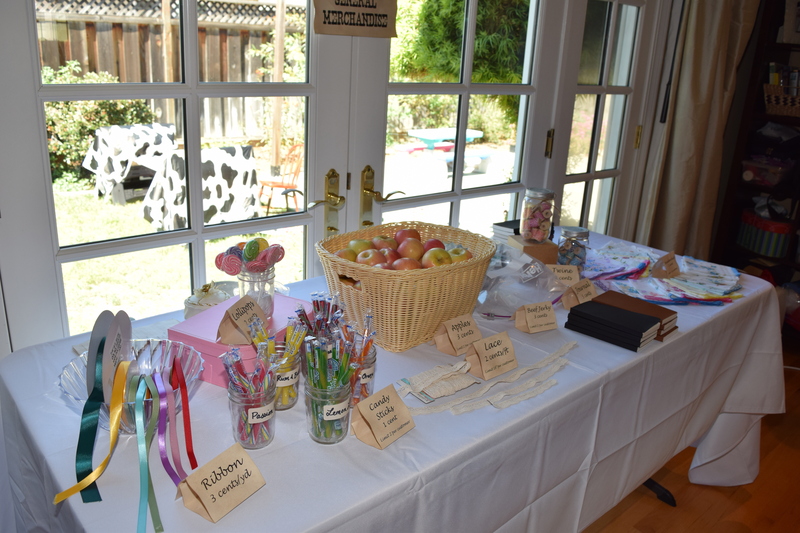 One of our guests told us our prairie party “was the best party ever!” Leave a comment and tell me about your Little House on the Prairie party ideas! Next Next post: Teambuilding with robotic insects!